Thirty-three year-old Italian Alessandro Pier Guidi and his 28 year-old British crewmate James Calado are the first winners of the GT FIA World Endurance Drivers’ Championship title as part of the FIA World Endurance Championship (WEC). 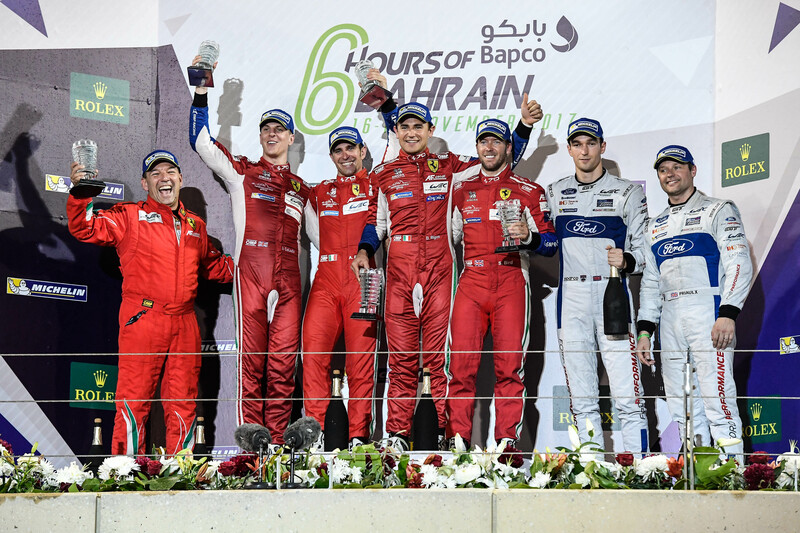 The pair won in the best possible way, dominating the final race of the season, the 6 Hours of Bahrain, along with their AF Corse teammates, Sam Bird and Davide Rigon. The drivers of the Ferrari 488 GTEs finished in parade, with car no. 71, starting from pole and key to the season’s triumphs, first over the line. Third and fourth place went to the nearest rivals of the 51 crew, the Ford no. 67 of Andy Priaulx and Harry Tincknell and Porsche no. 91 of Frederic Makowiecki and Richard Lietz. GTE-Pro. Pier Guidi and Calado and the whole Ferrari AF Corse team handled the race tactics to perfection. After a cautious start car no. 51 climbed the rankings and went ahead near the halfway mark, taking advantage of a Full Course Yellow phase that penalized car no. 71 that had pitted with the green flag. From then on James and Alessandro managed their speed carefully so as to protect the tires, but still successfully held onto their lead over their rivals in the final stage. However, Sam Bird in car no. 71 was faster towards the end so it was decided that no. 51 would stage a spectacular parade finish with Bird and Rigon who fully deserved the victory and for this reason were first on the finish line. This is Alessandro Pier Guidi’s first year as an official Ferrari driver, while James Calado is in his fourth season with the Maranello brand, having started racing in car no. 71 as David Rigon’s teammate in 2014. The world champions secured the title at the end of an almost perfect season that, after a bad result in the Le Mans 24 Hours, saw them climb up the standings with wins, first at the Nurburgring and then at Austin and at Fuji. This is Ferrari’s 22nd victory in the WEC, the 27th including those obtained in the Intercontinental Le Mans Cup 2010 and 2011. GTE-Am. Two 488 GTEs were on the podium in the GTE-Am class. After a long struggle with the Aston Martin title winner driven by Dalla Lana-Lamy-Lauda, no. 61 of Clearwater Racing came second with Keita Sawa, Matt Griffin and Weng Sun Mok, ahead of car no. 54 of Spirit of Race with Francesco Castellacci, Thomas Flohr and Miguel Molina. The overall victory went to Buemi-Nakajima-Davidson of Toyota.